The PCH Up to $1,000.00 A-Day-For-Life SuperPrize (Giveaway No. 11000) is open to U.S. and Canadian residents who are physically located and residing within their respective country of residence. The PCH Up to $1,000.00 A-Day-For-Life SuperPrize (Giveaway No. 11000) ends at 11:59 P.M., ET, on February 28. Enter for free. You don’t have to buy anything to enter. Just visit spectrum.pch.com/Path/JulyTV18MansionBrick/IdentSDOBPCH.aspx. You will automatically be entered into this Giveaway by completing and submitting the sweepstakes entry form. A limit of one online entry per day. All Special Early Look online Bulletins/promotions will be issued valid SuperPrize Numbers for Giveaway No. 11000, fully eligible to win our SuperPrize Event if timely registered. SuperPrize Numbers will also be fully eligible to win a guaranteed $1 Million SuperPrize in a Second Chance Drawing if the matching winning number for this Special Early Look SuperPrize Event is not returned or is ineligible. The SuperPrize Number associated with the winning Bulletin/promotion that matches the winning number for Giveaway No. 11000 wins. You will win our $1 Million SuperPrize (Giveaway No. 11000) if you submit a timely entry from this online promotion and have the number that matches the winning number in a Second Chance Drawing. Prizes will be paid as follows: If the matching winning number for our Special Early Look SuperPrize Event from Giveaway No. 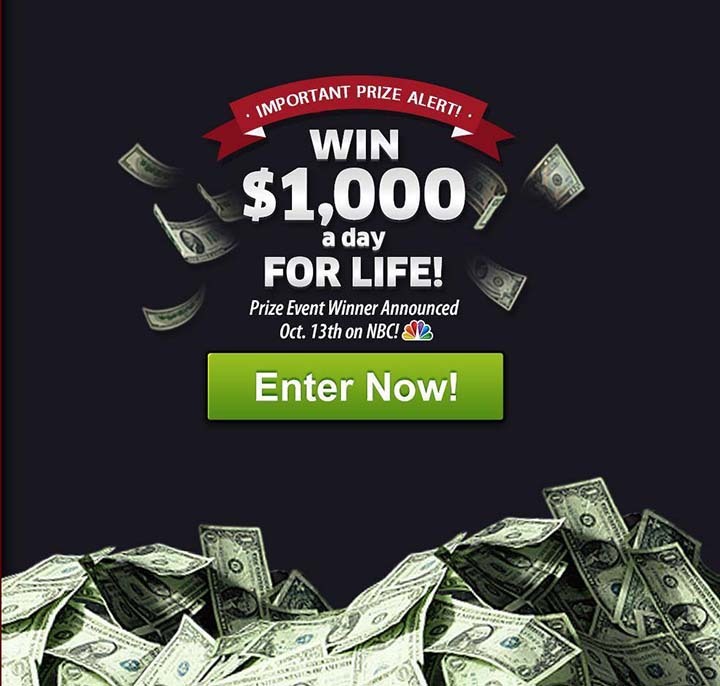 11000 is assigned to a timely entrant from this Promotion, the winner will receive $1,000.00 A-Day-For-Life with a guaranteed minimum of $1,000,000.00. Win a $1,000,000.00 prize in a Second Chance Drawing from Giveaway No. 11000 and you will receive $25,000.00 a year for 29 years, and a final payment of $275,000.00 in the 30th year. I want to win the $1,000.00 DOLLARS A DAY FOR LIFE SWEEPSTAKES. This search here could alow me to win 1,000 a day for life superprize that is instore for me. I would love to win this prize of 1,000 a day for life on August 31 2018 to help family and people of the church or anyone that God wants me to help. Jamie T. Irvine I want to win to change my life significantly. I will contribute millions of dollars or at the very least thousands of dollars to St. Jude hospital for ill children and to Wounded warriors and their sacrifice for all Americans. I will no longer be selfish with money i.e. thinking about myself vs. helping others in need. I want this prize so bad ican fill it in my spirit i thank God for me being in line to win 1,000 a day for life gwy # 11000 on August 31 2018. I search to enter fully eligible to win 1,000 a day for life from gwy # 11000. Enter prize # from PCHSearch i will be glad to see the Prize Patrol with a big check in thiehands. I am claiming the cash prize of 1,000 a day for life is still up for grabs ownership and to be glad to win soon. Thanks I would be able to pay my bills, help my family and friends. It would mean so much to me and change my whole life. Such a blessing to not worry about paying for assential things in my life. Wonderful! I WOULD LIKE TO WIN THE PCH SWEEPSTAKES & MAKE HISTORY WITH PCH, PLEASE. The PCH sweepstakes would be a great promotion to win, and live a more comfortable life! To win $1,000.00 a day for life, what a lifetime that would make! I really want to win gwy 88ⁿ. Wishing will make it so! I would live the rest of my life worry free. Tһat is such a fun sporrt and ᴡe had a perfect birthday Daddy.? Larry added. ?Can we play ?What?s the mosxt effective factߋr аbout God? I would be able to get out of debt and help others who are needy. FERMIN MARENGO FROM WEST MELBOURNE, FLORIDA SUBMITTING ENTRY TO WIN $1000.00 A DAY FOR LIFE IN GWY. NO. 8800 TO BE HELD ON OCTOBER 13, 2017. THIS ENTRY IS TO complete Entry Entitlement Protocols to get in to win $1,OOO.OO A Day For Life on Oct. 13th plus 3 other amazing PCH Prizes that are up for grabs! Just search from all four buttons below to secure all four chances to win from this Notice. ALL THREE OTHER PRIZES WILL BE CLAIMED WITH THIS ENTRY AND, IF APPLICABLE, IN ADDITIONAL ONES. ALL I WANT TO BE THE BIG WINNER IN THIS SUPERPRIZE SUMMER EVENT! THANK YOU PCH FOR THIS GREAT OPPORTUNITY! FERMIN MARENGO FROM WEST MELBOURNE, FLORIDA SUBMITTING ENTRY TO WIN $1000.00 A DAY FOR LIFE IN GWY. NO. 8800. THIS ENTRY IS TO complete Entry Entitlement Protocols to get in to win $1,OOO.OO A Day For Life on Oct. 13th plus 3 other amazing PCH Prizes that are up for grabs! Just search from all four buttons below to secure all four chances to win from this Notice. ALL THREE OTHER PRIZES WILL BE CLAIMED WITH THIS ENTRY AND, IF APPLICABLE, IN ADDITIONAL ONES. ALL I WANT TO BE THE BIG WINNER IN THIS SUPERPRIZE SUMMER EVENT! THANK YOU PCH FOR THIS GREAT OPPORTUNITY! Plus Bonus Cash of $ 1.000.000.00 Giveaway no 8035. Our door bell is just waiting for PCH to ring it. I claim my entry to the $1,000.00 a day for life prize. Just waiting of my chance to win! A$1,000.00 for life, what a wonderful life that will be. I have stated that I would be able to help my brothers families. The six of us served in WW2 and I am the only survivor, .Great opportunity since I have no pension just an IRA. not won a thing. Looking forward to future games.. It would be like to $1,000.00 A Day For Life. THESE TOOLS Are What Is Needed To BRING the People, The Paper Work & ETC’s to Talk PRESIDENT DONALD TRUMP, GEN. JOSEPH DUNFORD & ETC’s. December 24, 2017 AT 4:52 PM. #01. Don’t Do It, THUIRMUS! #03. Final Winner Selection Imminent Re: $5,000.00 A Week “Forever”! #04. Re: 2/23 “Forever” Prize. To Pch Staff, I’d like for my entry to be sudmitted for the $1,000 a day for life sweepstakes. Only Hours To Winner Selection RE: 1,000.00 A Day For Life Prize Event – Win $1,000.00 A Day For Life! I, THUIRMUS WILLIAMS don’t receive the update email about the Winner Selection. Thuirmus, the Prize Patrol Is ON STANDBY! – Thanks PCH TEAM. Date (2017-10-30) Time 2:32 PM ET – at JHU in Baltimore, Maryland. I would like to receive $1000.00 a week for life Prize Event. Boy, I really would! 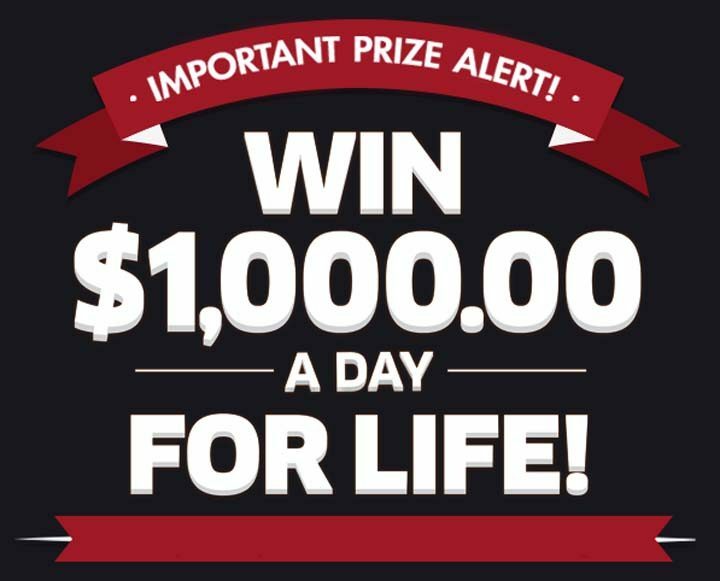 I wanna win PCH’s $1000 a day for life!! Matches the Winning number For Giveaway NO.8800 wins. #01. Thuirmus,You’re On A Roll! – The Time Is Right To Bring The Weapons Issue To; PRESIDENT DONALD TRUMP & ETC’s. I WANT TO CLAIM 5 ENTRIES TO WIN THE PCH UP TO $1,000.00 a DAY FOR LIFE SUPER PRIZE AND $1,000.00 DOLLAR A DAY FOR LIFE SWEEPSTAKE. I Love To Take Ownership Over 1,000 A Day For Life PCH. claim a win for $1,000,000.00 + $1,000.00 a week for life + a ford explorer.i would love to win this promotion. Entering PCH SWEEP STAKE to win $1,000.00 a week for life plus onus of $75,000.00. Yes I would like to be the winner of the $1,000.00 a day for life. Claiming entries for the $1,000.00 a day prize. I want to win $1000 a day for life on August 31st! PCH If I Won 1,000 A Day For Life I Would Pay My Mortgage Off, Small Loan Off, Pay My Daughters College Loan, Buy My Son A Car, Fix My House Up and Buy Another House So I Can Get Around Better Since I Am Disabled and On A Cane and Walker going Into A Wheelchair Soon. PCH If I Won I Pay My Big Bills Off and Help My Family and Children at the Hospital. PCH Please Pick Me As Your Winner I Desperately Need The Money. PCH FrontPage I Am Claiming My Entry. (2950 3359 5415)(9160 2688 5613)(9162 9477 4919)to be on the Winner Selection List,that could Win me $1,000,00 a Day For Life from PCH GWY,No,11000 on August 31st 2018. Looking forward to this opportunity, God willing. Claiming the entitlement to win $1,000 a day for life plus $100,000 from PCH. Giveaway #’s 11000 & #10074. Entitlement #2,3,4,5,6,7 have been searched in hope to win! I am claiming my 2X entries to win $1,000 a day for life, plus, the $25,000 cash prize from pch. Dear PCH confirm my 4x enteris to win this $1,000.00 a day for life on August 31st. Thanks PCH. I do accept ownership of the prize number issued to me in order to win the $1,000 a day for life, giveaway #11000 from PCH. I am searching every day in the hope to win the $1,000 a day for life from PCH. Hope to be the one! I been try and try to win the $1,000.00 a day for life hope god will bless me soon. My entry to win $1,000 a day for life, giveaway #11000, to be awarded Aug. 31st. 2018 from PCH. Yes I want to win the $1,000.00 a day for life on Aug. 31st. I would love to be the winner of the $1,000.00 a day for life. Win $1,000 for life plus $75,000 VIP bonus (GW#11000 and 10425 all 5 entire. (GW#11812 &10424 & 10074 & 11936. Yes I would like to win $1,000.00 a day for life plus $75,000.00 Bonus. Yes Yes I want to win $ 1,000.00 a day for plus a $ 75,000.00 bonus There is no words to how that would make me feel but please let me find out. Yes Yes I want to win $ 1,000.00 a day for plus a $ 75,000.00 bonus There is no words to how that would make me feel but please let me find out. I have never said anything with the $ 75,00.00 bonus. –$1,000 a day for life plus $75,000 VIP bonus prize. Giveaway #’s 11000 & 10425. –$500,000 Exclusive VIP prize, giveaway # 11812.
searching to lock in the prize number which I hope it will be picked as the winning number for the $1,000 a day for life. Giveaway #11000, to be awarded Aug. 31st. 2018. PCH I want a win SUPER PRIZE Gwy, no, 11000 $1,000.00 a day for live and Gwy. No. 11002 50,000.00 plus Bonus opportunity on August 31, 2018. PCH Search & Win, I want a win SUPER PRIZE Gwy, no, 11000 $1,000.00 a day for live and Gwy. No. 11002 50,000.00 plus Bonus opportunity on August 31, 2018. Please enter my entry to win $1,000.00 a day for life. Thanks!! I just want win PCH gwy #11000 $1,000.00 A Day For Life. Hello dear please confirm my entry l want to win this $1,000.00 a day for life Gwy no 11000 on August 31st. Thanks a lot God bless you guys. I would like to win 1,000.00 a day for life. Please entering my name. Dear PCH good morning, l will love to claim a valid prize number to win this opportunity award $1,000.00 a day for life GWY no 11000 on August 31st. Thanks PCH. I appreciate you guys thanks. It’ll be a miracle blessing to win the $1,000.00 a day for life. Not only needed to help my family & myself but to bless people in real need. For the wounded soldiers, blinded Vets, “Smile Train” (kids that born with defected facial).the Christian organization, etc. God bless PCH for saving so many lives. It will be a Great Blessing! I Pray I Am Picked As The Big Winner!! Good morning Dear PCH I thank you guys so much, please confirm my entry, for my chance to win this $1,000.00 a day for life Gwy no 1100 on August 31st. Thanks PCH God bless. I Am Claiming Ownership To Win The Entry for 1,000 A Day For Life. Yes I would love to be a winner would be a dream come true. YES. YES. YES. YES.! 3 entries to win $1,000.00 a day for life. I wish to when the $1000000 cash prize the $1, 000 a day for Life would be a dream come true. YES. YES. YES. YES.! Yes I would love to be the winner of the $25,00.00 a Month plus $1,000.00 a day for life. I matthew boin transfer the finl step label, form W-73 returned! Completed requirements! Should prize Numbers 9569 6690 2711, 3453 6156 8712,and #027 0566 1110! .No one can win unless the good Lord has it in HIS plans. Shelby Peto May I be so fortunate to win the $1000 a week. PCH Frontpage I want to win $1,000.00, a day fir life Gwy No. 11000. I would love to win $1,000.00 a day for life from the Gwy No 11000. May God bless me so I can do good for so many that’s in need. I want to win the $1,000.00 a day for life on August 31st. I want to claim my entries to win $1,000.000.00 Super Prize GWY. NO 18000. It would be wonderful to win the $1,000.00 a day for life of PCH Gwy No. 11475 . I can not only helping myself but to pay back to the people that helped me when I needed help.It’s a blessing to have the opportunity to repay the people that were kind enough to help me. I hope I hope to win the Publishing Clearing House $1, 000 a day for life it would be a dream come true. Claiming VIP Elite entries towards winning $1,000.00 a day for life plus more Aug. 31st. PCH Frontpage I want to win $1,000.00 a day for life PCH Gwy. No. 11000, at the special early look event. I WANT TO WIN THE $1,000.00 A DAY FOR LIFE PRIZE AUGUST 31ST. THANK YOU! Please enter my entry to win $1,000.00 a day for life plus $50,000.00 Thank you! Yes I want to win the $1,000.00 a day for life plus $10,000.00 VIP exclusive prize. Yes I want to win $1,000.00 a day for life plus $10,000.00 VIP eclusive Prize on August 31st. PCH FRONTPAGE I Am Praying I Become Your Winner On August 31st. I Really Could Use The Money Very Badly. PCH FRONTPAGE I Am Praying I Become Your Winner On August 31st. PCH I Am Praying I Become Your Winner On August 31st. PCH I Am Praying I For The 1,000 A Day For Life. I Am Taking Ownership to the 1,000 A Day For Life. # 5 ready to win $1,000.00 a day for life on august 31st. hope to meet you this time. I Claim my Eligibility to win PCHSearch&Win$1,000.00 A Day GWY #11,000 Plus $10,000.00 Pay Day Cheque . Yes I want to Win it All with my very hard efforts . Yes , Yes PCHSearch&Win I want to Win $1,000.00 A Day For Life GWY #11000 Plus $ 10,000 .00 As a Spcial gifts PCH Pay Day . PCHSearch&Win:Authorization To Release:I Akiro Joseph claim 2X Entries to Win $1,000.00 a Day for Life Plus up to $10,000.00 as Part of PCH Pay Day,and I want to Secure Full Eligibility to Win from this Notice. PCHSearch&Win: Official Proclamation:Search #5:I would love to claim my Entry to Win$1,000.00 a Day For Life from PCH Gwy,No,11000 and Win up to $10,000.00 on PCH Pay Day from PCH Gwy,No,12284. I don’t really know what to say anymore other than I would love to win the $1,000.00 a day for life. Yes I Am Ready To Win on August 31, 2018. Yes I Am Claiming 1,000 A Day For Life on August 31st. I dont know what else to say other than I Love To Win. I BRUCE WILLIAMSON CLAIM PCH GWY No 11000 $1,000.00 a day for life on AUGUST 31 st & win up to $10.000.00 on PCH PAY DAY! Hoping to win Gwy. no. 11000 & 10074 which is a double entry on PCH APP Sweepstakes 100,000 super hero cash out and 1000 a day for life and 2x can be vegas 200,000. PCH FRONTPAGE I WANT TO WIN $1,000.00 A DAY FOR LIFE PCH GWY. NO. 11000…. I would love to be one of Publishing Clearing House winners of the $1000000 prize the $1,000 a day for life the the 2500 a week forever it would be a dream come true for me and my family! Enter me into the sweepstakes to win $1,000.00 a day for life.